If you’re a non-profit collecting donations through Wufoo, you’ll be happy to know that you can use our services to also incentivize your donors into giving more by offering gifts based on a tiered system of donation. 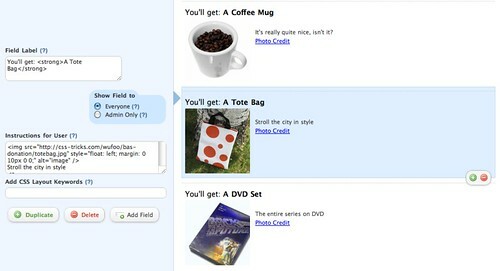 Inspired by a donation form designed by the [Boulder Acoustic Society](http://boulderacousticsociety.net/), we created the following tutorial to show you how to use our payment integration features combined with our Rule Builder to show people what gifts they are eligible to receive at various donation levels. The first thing you’ll need to do is wet your visitors’ appetite with a list of gifts they can recieve at different donation levels. In your new form, you can just use a Section Break field for this, which allows you to add some basic HTML formatting. Here we have listed our donation levels inside <strong></strong> tags and then the gift after. Somewhere in your form you are going to need to ask for the donation amount. For that, we’ll add a **price field** right up top by the list of gifts. 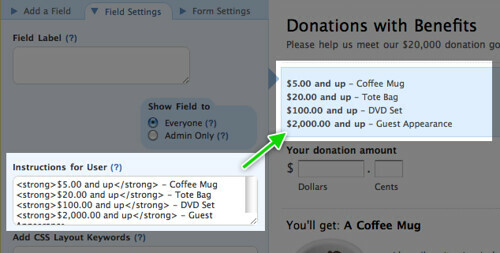 An alternative to the price field could be a dropdown menu of donation amount levels. We recommend making this field required so that users can’t fill out a donation form without specifying an amount. If you want to insure a base level of contribution, you can also give this field a minimum value. 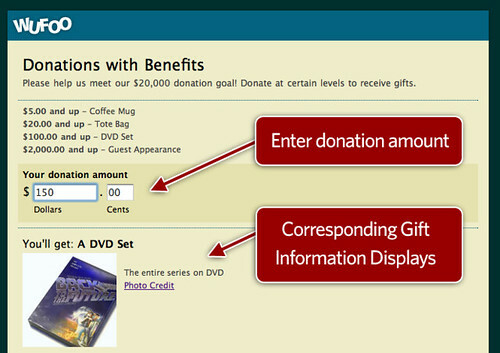 Then for each gift, create a section break with more details about what the donator will receive. This gives us the opportunity to elaborate on the gift, and even include photos! The rule’s action will be to **SHOW** the Coffee Mug gift, our gift at that level of donation. You’ll need to create a rule for each tier. For our example, we’ll create four field rules: another rule for greater than $19.00 and less than $100.00, another for greater than $99.99 and less than $2,000.00, and another for greater than $1,999.99. Because we’ve attached a **SHOW** action to each Section Break detailing the gift information, Wufoo automatically figures out that those Section Break’s will therefore need to be hidden by default until the logic we just set up applies to them. Pretty neat, eh? The last step is setup our form to collect payment. Again, head back to the Form Manager and click the Payment button beneath this form. In the Payment Settings you can then set up your merchant account information. 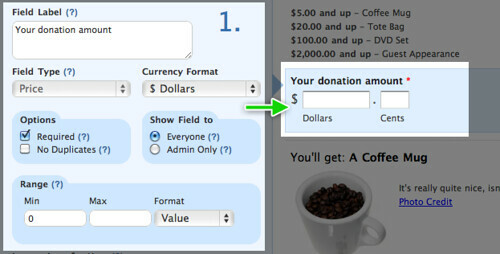 In the third box, select the donation amount field from the dropdown and click the “Assign Prices to this Field” button. That will then allow you to connect the dollar value to how much is collected from the user after submitting the form. Make sure the Enable Payment checkbox in the upper right is selected and then save your Payment Settings. And that should do it. Easy as pie! If you have any questions or need help, get in touch. We’d also love to see any of your forms if you decide to give this idea a shot. Many thanks goes out to Scott Aller from Boulder Acoustic Society for taking the time to share his ideas with us on how to get more out of Wufoo. Posted August 11th, 2010 by ali. Very Cool! Thank you, we’ve been looking for something like this. Posted August 11th, 2010 by Chais Meyer. Posted August 11th, 2010 by joao.